When he was 14-years-old, Yusuf Shawamreh was shot down by IDF soldiers near Hebron for crossing a fence to pick akub in what was once his family’s land. The soldiers were meters away, armed and armored, watching on cameras as he and his friends moved slowly towards the entry point. Yusuf was murdered for climbing through a hole – the same hole the human rights group B’tselem says the IDF had been aware of for at least two years and had allowed civilians to pass through before. There is surveillance footage showing him cross through with his friends. Footage of the soldiers carrying his body back over the fence. Footage of those moments before the murder when Yusuf and his friends crossed open ground moving towards “the separation fence” that borders the open-air prisons where Palestinians have been imprisoned under an Israeli regime. 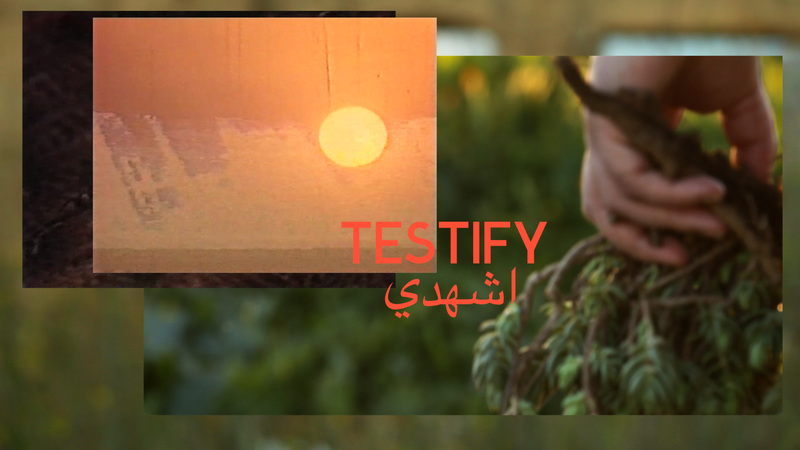 That footage of Yusuf’s murder, released to the public after the trial of the soldiers who killed Yusuf, is a critical keystone for Ramallah-based artists Basel Abbas and Ruanne Abou-Rahme’s video work Only The Beloved Keeps Our Secrets (2016). 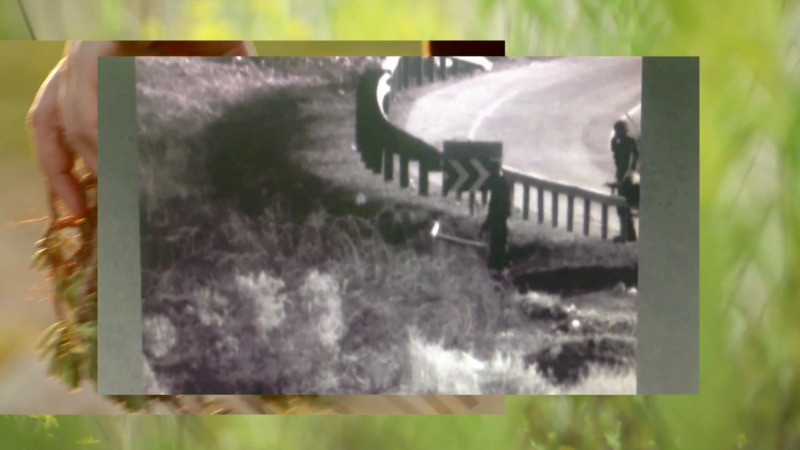 The black and white surveillance video is layered, flashed over the yellowed green of a field where a man walks with a bouquet of thistles in his hand. In the background, we hear the artists’s composition, a fractured industrial sound that is simultaneously flat, almost atonal, yet rhythmic. Nearly constant but ebbing and flowing with the layered video. The surveillance footage, devoid of color, depict the movements of men with blurred faces. The landscape behind it is vivid. We feel the breath of the air on the man’s hand, the wind blowing through the bouquet. It is incongruous that both videos depict the same landscape. The collage of video continues. We see spiny thistles blowing in the wind amidst the ruins of an abandoned building, a reminder of the history of the land torn from its inhabitants. 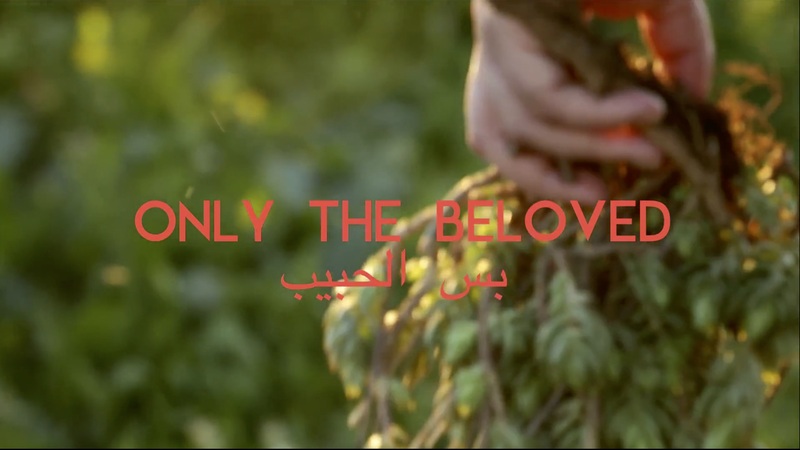 “ONLY THE BELOVED” flashes for a moment across the screen in minimalist pink text announcing the title of the work, its translation in Arabic hovers below it. Another clip is overlaid in the bottom left corner of the screen. Another black and white video. Here, a woman in a white hijab dances in a crowd, elbows hugged tightly to ribs. The clip disappears. 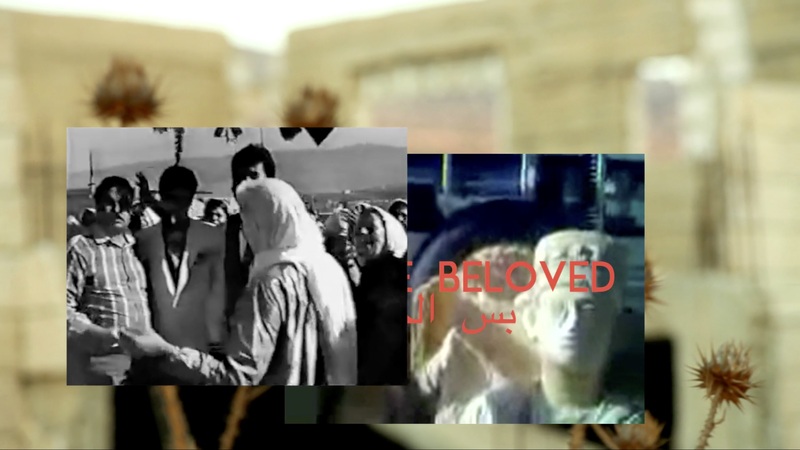 In the center of the screen a clip of statues taken from their original homes, placed in what looks like the bed of a truck, stacked on atop the other, the remnants of a cultural history being erased. Pink words flash on the screen again. The woman dancing reappears. 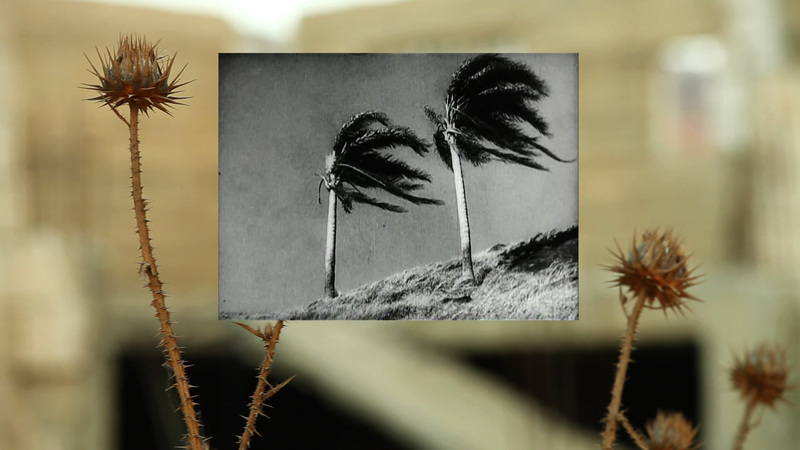 Another black and white clip of two palm trees appears, their palms blow to the right of the screen. The abandoned building remains everpresent as the backdrop. The woman dancing disappears. Palm fronds blow in the wind over the ruined building. The ruins disappear. The ten minute videos continues in this way, the poem flashing over the screen, over the clips. The text hovers for a moment before disappearing with the images. Through the endlessly cycled collage of clips and flashes of words, we see the surveillance footage alternate with the clips of the woman, of the statuary, of the ruins overgrown with the natural vegetation. That footage is interspersed with more natural imagery, additional clips of song and dance, clips of other violence in Gaza. The result is a fractured landscape that considers land and history not as a traditionally static image of nature, but as place defined by history and culture, as a place whose characteristics are defined by its people and traditions as much as it is defined by the resources of the land itself. The video is jumpy. It asks to be watched over and over again to grasp the meaningful repetition of image and word. Our attention is repeatedly diverted and redirected. That jumpiness, however, is mitigated by the repetition – by the reminder of a simultaneity of history, the simultaneity of natural processes on the land and human ones. 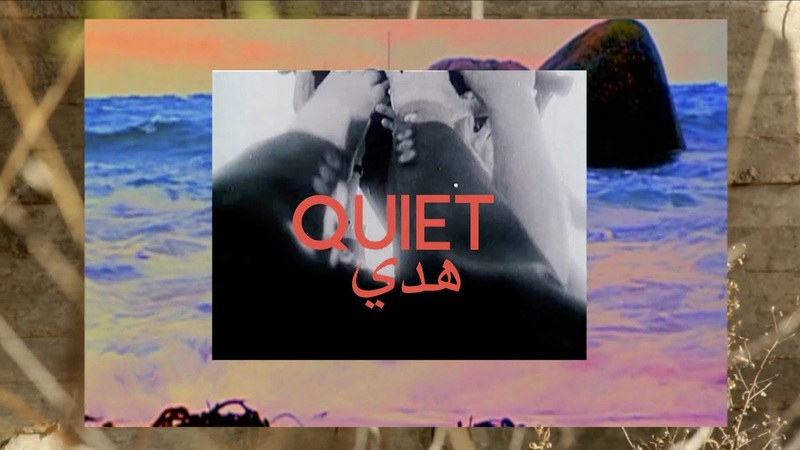 The artists tell us that Yusuf’s murder is concurrent with the movement of the thistles and palm fronds blowing in the wind and the cycle of the sea waving over the shore. That both clips exist simultaneously with the traditions and rituals depicted in the videos of song and dance. The history of Palestine in the last century is a history of erasure. Of lands stolen, homes destroyed, and families separated that tradition might die and the land be reclaimed. 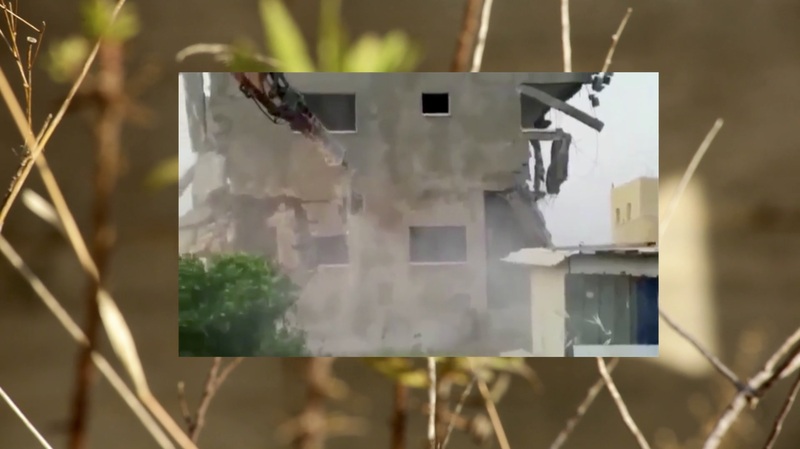 The clips of old ruins being destroyed by bulldozers, of art being removed from its origins to be exported, of traditions that only hold value as they are repeated and relived in the present suggest the artists’s concern with that history. We understand that those parts of the history of a place are temporal until we integrate them into collective memory; temporal especially in comparison to the eternal reality of nature, of the clips of vegetation native to the land reemerging in the space, of the constancy of waves cycling from shoreline to sea, or of the clouds accumulated in the sky. There is the sense that the history of the land remains in the land, even as society erases it. That something is preserved and reiterated even amidst the history that disappears. That the sea might bear the message, that the land and its history be revived by its testimony. Edward Said once wrote that living in exile is living with “the unhealable rift forced between a human being and a native place.” Abbas’s and Abou-Rahme’s work offers a profound reflection on the statement. It at once asks us what defines the native place? The land? This history of its people? The erasure of that history? The eternity of the land? And then it goes further. It asks again what it means to long for that place, to long for a time before the rift was sown. It reminds us that even with the erasure, the memory cannot be destroyed. The stories and traditions reenacted in art, in performance, even on distant land reiterates and testifies to a home even when it is gone.